Assign a program to be run upon alert generation. Categorize alerts into three priorities: high, medium, and low. Configure which device, or device groups, are to be monitored for the events. Provide additional parameters such as the specific users or domains that you want to trigger alerts. Specify how many times, and within how many minutes, an event should occur for the alert to be triggered. Choose from over 500 predefined alert criteria or define custom alerts. Be alerted for any compliance policy specific events. Receive alerts for custom correlations, such as when the correlation of two or more events calls for further investigation. EventLog Analyzer includes over 500 predefined alert criteria for Windows, Unix, applications, network devices, threats, and vulnerability scanners. Predefined alert profiles eliminate the need to create alerts for the most common events, saving the administrator time and energy. 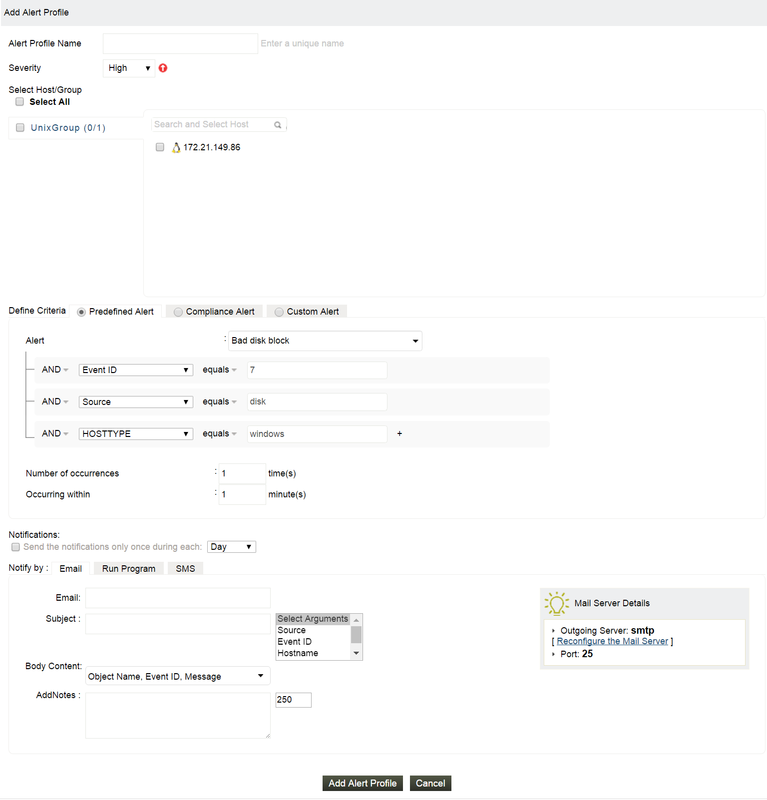 Build custom alert profiles by defining all criteria from scratch, tailoring to your specific needs. Provide basic and advanced options. Compliance alerts are automatically triggered in case of any compliance policy -specific events. Include or exclude the events that pertain to your environment. EventLog Analyzer allows correlations to be made between two or more events. Create rules for custom correlation alerts combining events from your routers, firewalls, servers, and other devices. These custom correlation alerts are highly accurate, as all events are validated with those from other devices. Centrally manage collect, analyze, correlate, and archive log data from sources across the network. Get predefined reports and real-time alerts that help meeting the security, compliance, and operational needs.